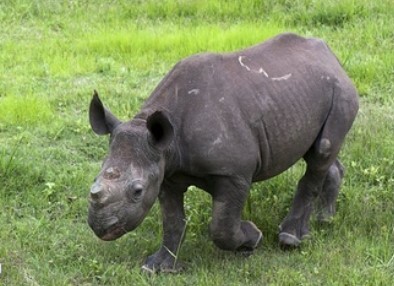 Baby Rhino Odin at Baby Rhino Rescue | Adopt and Donate Now! He was approximately two years old. Because black rhinos are highly endangered, the rangers wanted to make sure that Odin was safe. He was placed with other black rhinos in enclosures in the Kruger Park to be part of the black rhino program there. He became depressed and stopped eating, so was transferred to Care for Wild Africa. When Odin first arrived he was confused and still depressed. He was given his own enclosure and spent most of the time sleeping. He is much better now, eating and becoming more active and friendly. He walks around, browsing on the branches that are placed in his enclosure. It is just a matter of time before he is ready to be placed in the “Impala enclosure” which is a beautiful place for a black rhino, with just the right thorn trees that he will be able to feast on. Eventually there will be a corridor for him into the wildebeest area where he will have lots of endless space to graze and his life will completely return to normal. The volunteers love Odin and want him to fully readjust and be happy. They spend time watching him. Everyone sees the journey that the other rhinos have made from being confused and sad to being incredibly happy young rhinos. It fills everyone with a sense of relief and assurance that Odin is well on his way to being a happy rhino too.